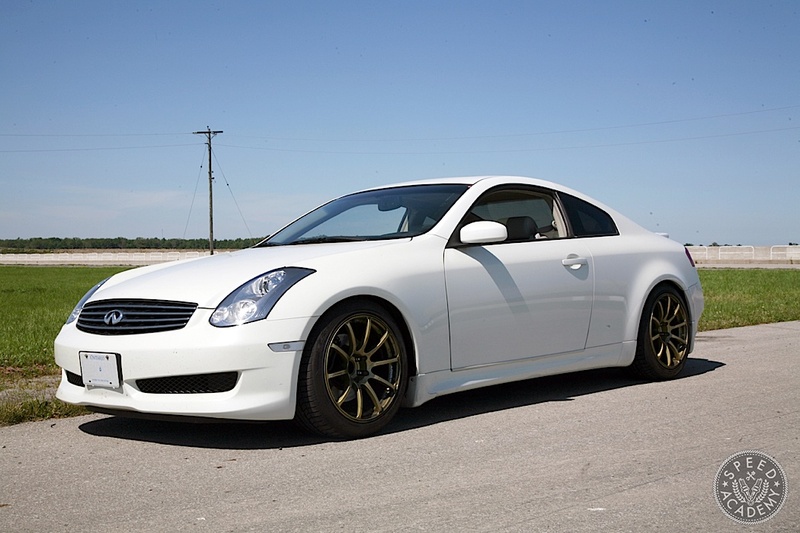 So we showed you how to bolt up over 40-whp to a VQ35-powered G35 or 350Z, which shaved 1-second off its lap time around our local test track (Toronto Motorsports Park). Now we’re going to show you were the biggest lap time improvements come from, starting with the grip component. 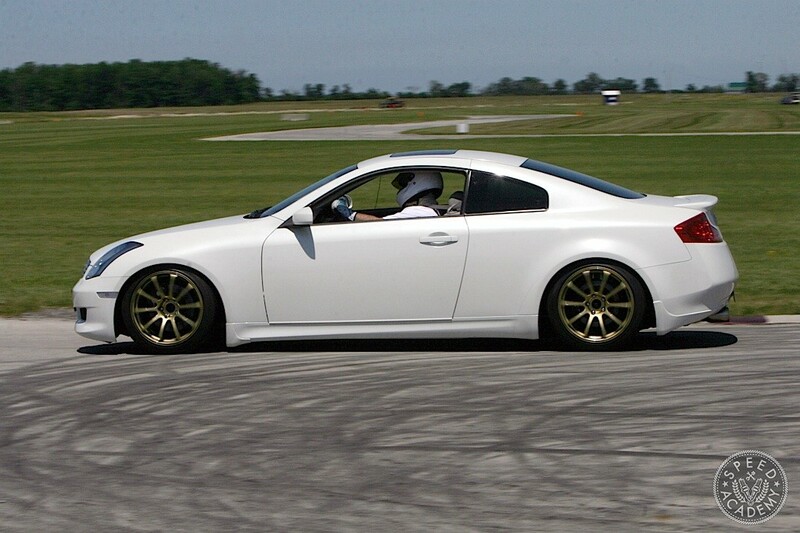 I’d already upgraded to a set of 18×10” Advan Racing RS wheels and a wider set of 265/35R18 Goodyear’s Eagle F1 Asymmetric tires prior to setting a best lap of 1:28.142 at TMP. That’s still pretty slow around that track, and it was obvious that three things were holding the car back the most: body motion control (too soft a suspension), understeer galore, and pant-wetting amounts of brake fade. I really should have addressed the brake fade first since it was downright dangerous at the track, but because I couldn’t be seen rolling at stock ride height, I started by swapping out the soft OE dampers and springs for KW Variant 3 coilovers along with Stillen front and rear camber adjustable control arms. As you can see, we did the wrenching at the track to ensure test conditions were consistent and thus any improvements seen being as meaningful as possible. One of the features we like best about the Variant 3’s is that they feature independently adjustable low speed compression and rebound shock damping. 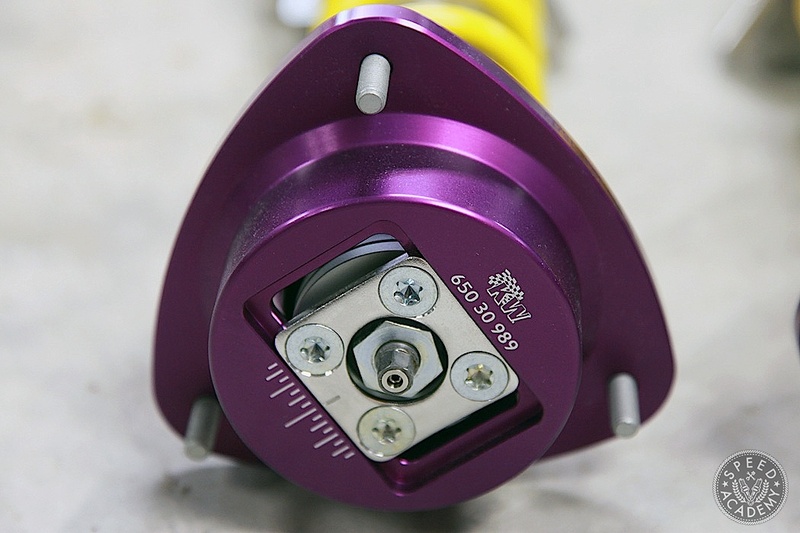 This means we can adjust how strongly the shocks resist low speed compression (or upward wheel travel when driving over a bump) via a 12-level adjuster mechanism located at the bottom of each shock body (high speed compression is preset by KW’s engineers). 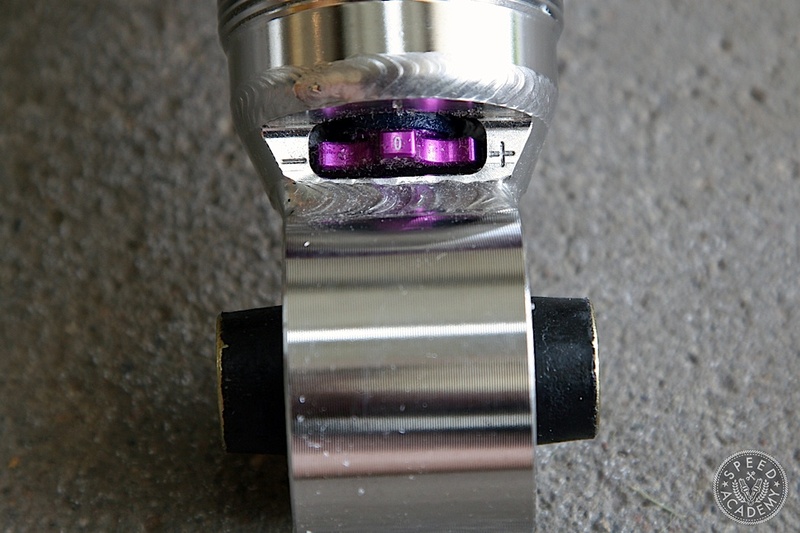 On the top of each piston shaft (at the shock towers) there’s also a rebound adjuster, allowing you 14-levels of control over how strongly the shock tries to push the wheel back down after a compression event has occurred. 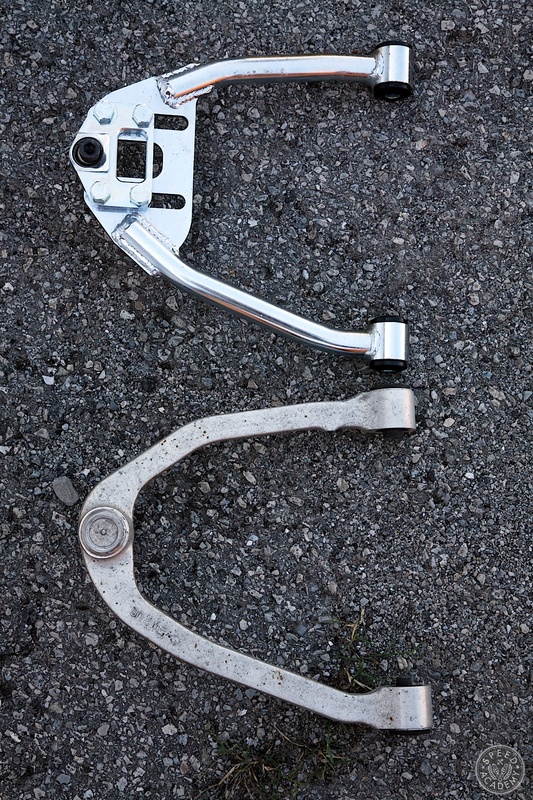 By adjusting the compression and rebound independently, you can dial in your car’s handling for a variety of surfaces, from smooth highway cruising to rough backcountry roads to your favorite racing circuit and everything in between. 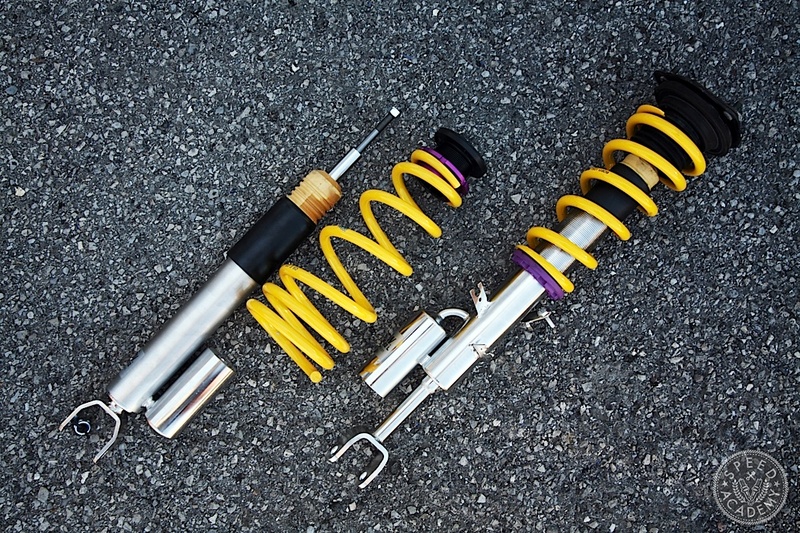 And being Canadians suffering through one of the harshest winters ever, we’re also big fans of the V3’s stainless steel shock bodies, which are extremely resistant to corrosion, so they’ll stay looking nice a shiny even when exposed to all the snow, slush, and road salt that gets thrown down this time of year. 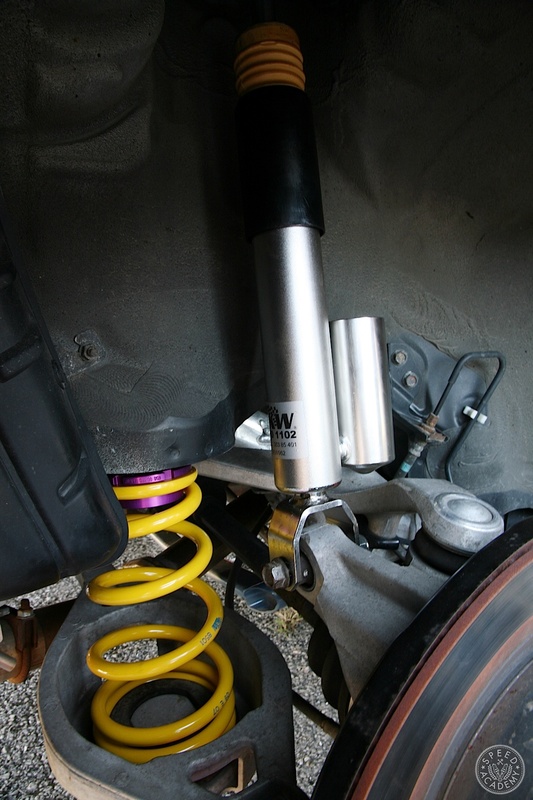 With a four-man team including Sasha from OnPoint Dyno and Moose our Targa tech we made short work of the swap, being sure to set up the compression and rebound settings on the shocks before installing them. 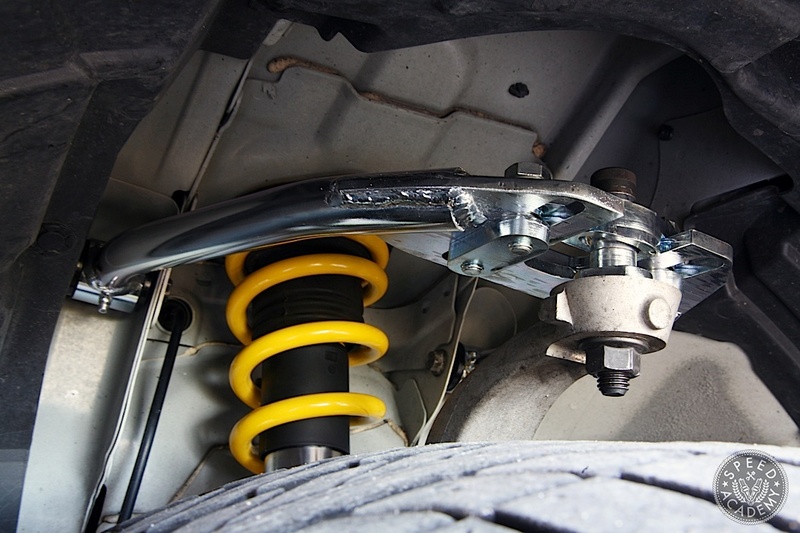 This is especially important for the rear dampers, since there’s no easy way to get at the compression adjuster on the top of the rear shocks once they’re installed. 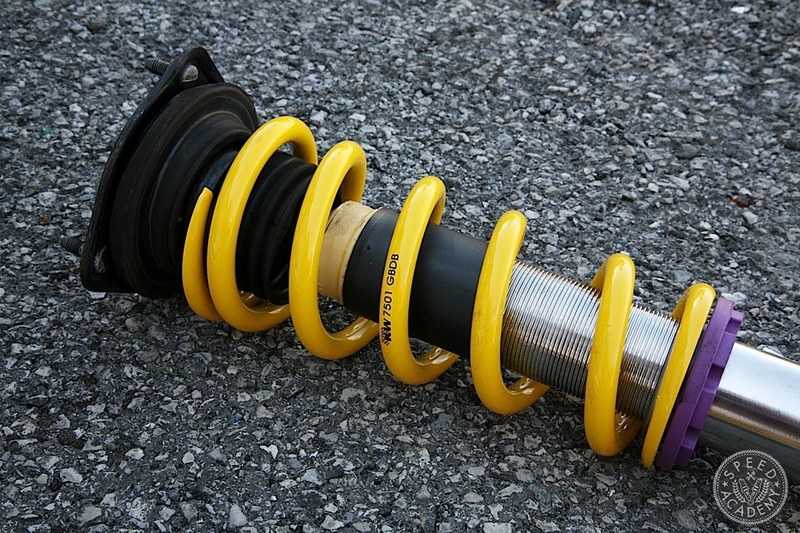 We decided to use fairly aggressive shock settings since we wanted to maximize on-track performance for the test. We went with 70% compression stiffness on all four corners to start, along with 80% rebound stiffness all around. We lowered the ride height by about 1.5-inches in the front and 1.25-inches in the rear, evening out the wheel well gap and helping corner balance the car’s weight distribution a bit in the process. 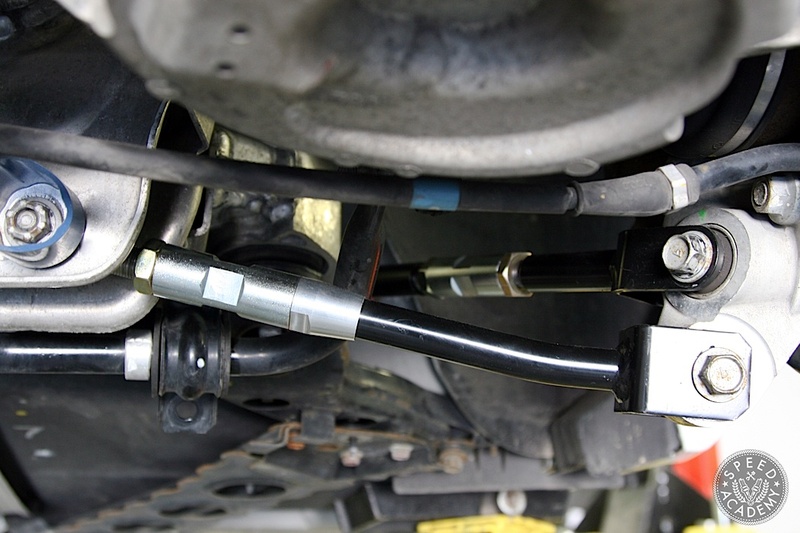 Still arms (top) use a camber adjustable spherical bearing in place of the non-adjustable balljoint on the OE arm (bottom). 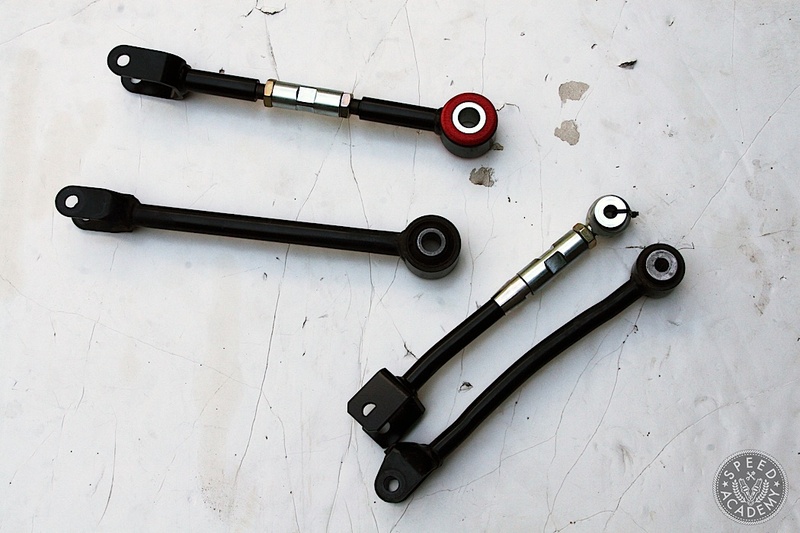 The Stillen rear camber adjustable arms use spherical rod ends for a zero compliance joint while the rear toe adjustable arms use a polyurethane bushing for reduced compliance. 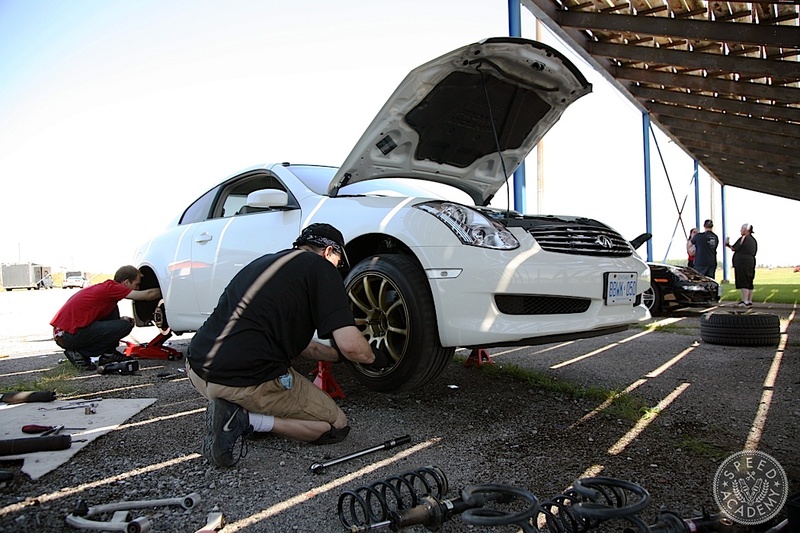 Although we didn’t have any high tech alignment tools or corner scales at the track, we did a basic track alignment using a hand-held camber gauge and aligned the wheels using toe plates and measuring tapes, just like I described in our DIY alignment story. We dialed in about 2.5-degrees of negative camber on each front wheel using the adjustable upper spherical bearing on the Stillen front upper control arms, along with 1/16-inch of toe out. Only minor adjustment of the rear lower Stillen camber arms was needed, since the lower ride height gave us close to the 1.5-degrees of negative camber we settled on, along with zero rear toe. But the Stillen rear arms are very easy to adjust, so for you grip or drift guys these things are a great investment. Adding Grip And Saving Time"
Do you have full specs for the rim size including backspace, I really like the way yours turned out.